Hi all! I have been wanting to get my hands on an old Mac SE for quite some time, these are not very usual in my country (argentina), and the few ones that popup every now and then at auction sites, ask crazy values (last week I saw one which turns on and displays the usual checkered pattern for the equivalent of about USD250). Talking to a nerdy old co-worker, like myself, he mentioned he had one stored for at least 10 years, which he rescued from being trashed in an old job, and offered it to me as a gift! so… I obviously accepted! The SE looks yellowed and dirty, but in one piece. Only got the Mac, no mouse/keyboard. I restrained from plugging it right away and went to buy a T15 1st, so I can check if there was something horribly and obviously wrong inside, as this was a Mac saved from the dumpster, my expectations were low. It was originally a 2 floppy system, but it was upgraded with a SCSI drive. 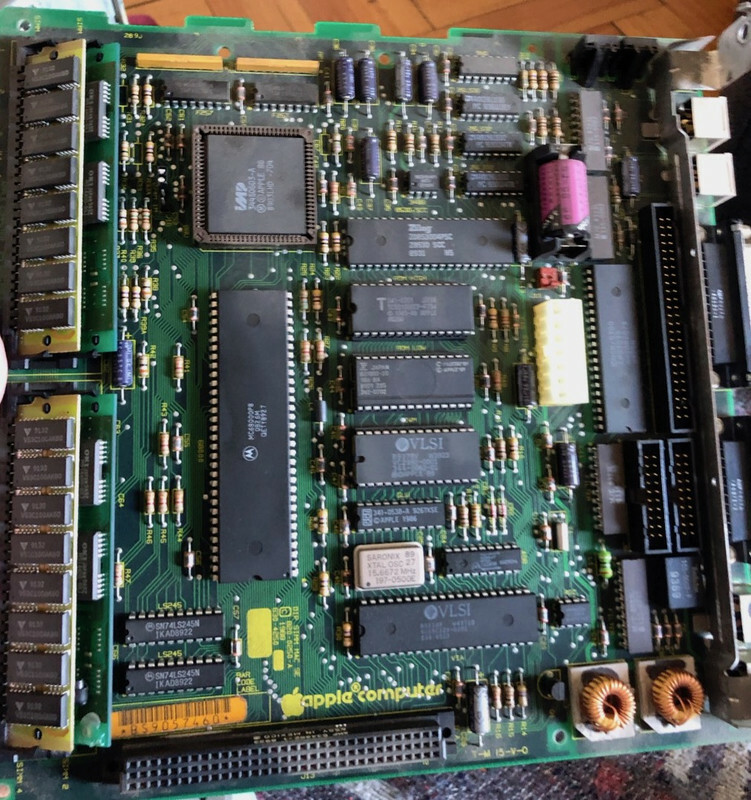 It was quite dusty, but the logic board seems to be in great (visual) shape, once I blew the dust, I couldn’t find anything which looked wrong; no leaky or swollen capacitors and even the PRAM battery didn’t leak (it’s a later revision board with a socket for the battery). this is a (terrible) video, where I moved the phone around to see if it picked the noise source better, but the only important thing is the ticking sound. The CRT doesn't seem to get energized at all (no static, noise or any glow at the neck). I removed the analog board and detached the PSU. I then plugged the PSU (an Astec unit) by itself, no noise. googled the pinout and checked with a multimeter, and all the voltages seem correct! 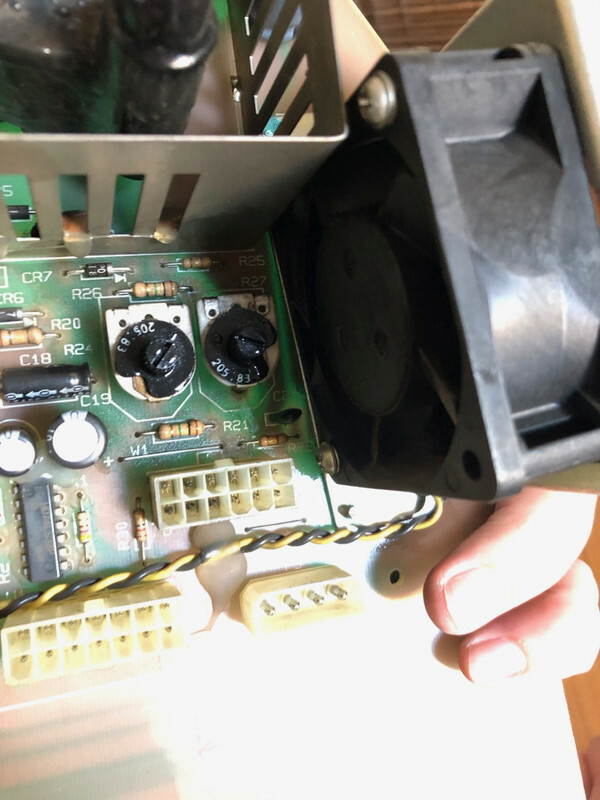 So… it seems like the culprit is the analog board. 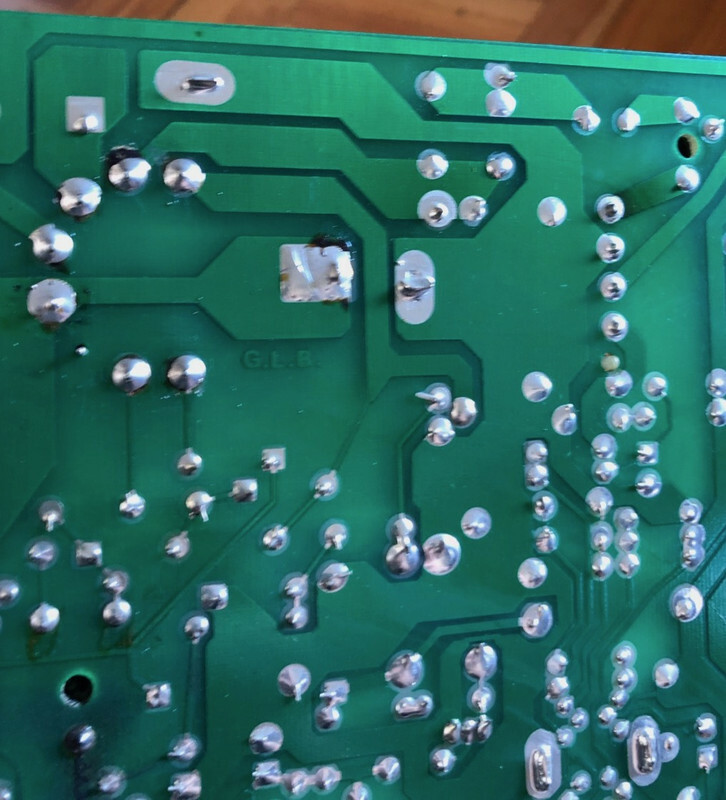 At 1st sight I cannot spot cracked solder points, nor bulged or leaky capacitors. 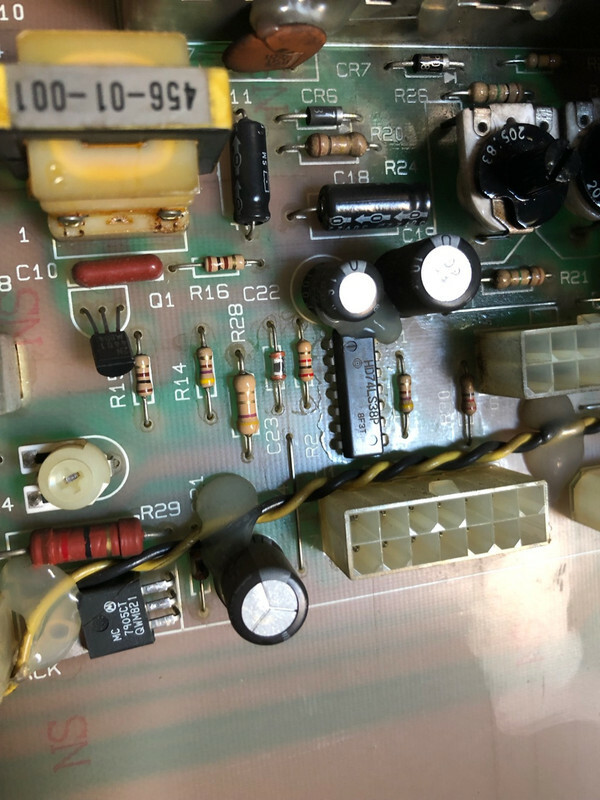 I did notice that the paper sheet used as an isolator behind the board, had some cooked dust mainly behind the 2 pots (for focus and cutoff) and for each of the solder points of the flyback transformer. I cleaned everything, all the contacts in the plugs with contact cleaner. Put all together and tried again, same ticking. As mentioned, the solder points for the flyback transformer are a bit dark, but not visibly broken. Not sure it means something, or just 15 years of heat when this was used? Is there any way to test it? getting a replacement? Are you sure it's not the fan making the noise? You can rune it safely enough with the bucket removed if you make sure the chassis is propped up in the back so the logic board is above the worktop. If you haven't tried that, listen for the ticking from all angles. Hi JT, I forgot to mention the fan! The fan spins freely (when off), doesn’t make any funny noises. When powering on, the fan kicks in for each time the PSU pulsates. It seems that the PSU’s crowbar protection is kicking in. Searching for more info, it seems that the ticking or “flupping” as per Larry Pina’ book, is not that uncommon. He suggests replacing diodes CR2 and CR3 and transistor Q2. All these in my board look pristine! I guess there’s no harm in replacing those. I’m afraid the flyback transformer is the culprit, as it will be near impossible to source it locally. If it's the flyback it shouldn't be exorbitantly expensive to source and ship one from just about anywhere. My guess was flyback right after fan. If you run it with the bucket removed you should be able to localize the source. If you still can't tell where it's coming from try a paper towel tube as the inverse of a hearing horn. From a few different angles you should be able to triangulate the origin of the ticking. Works with cars anyway. 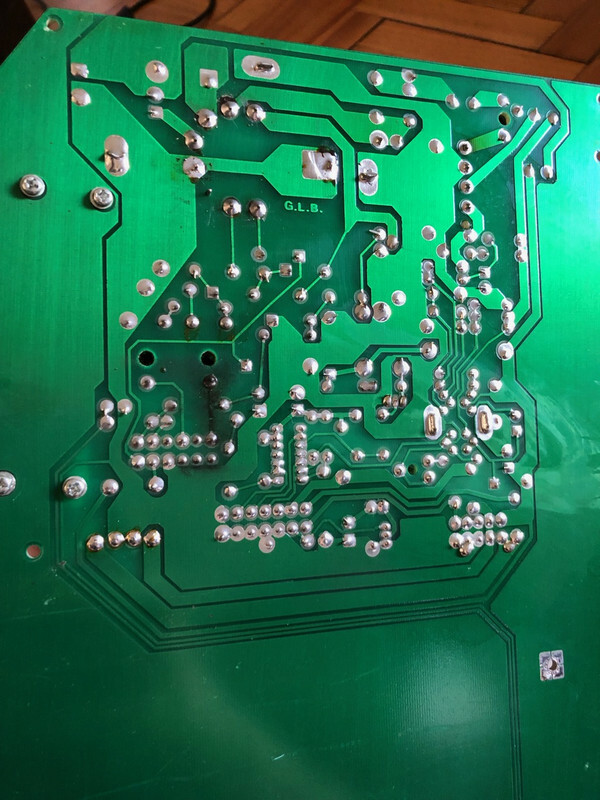 Quick update: I re-soldered all suspicious points in the analog board, replaced CR2 and CR3 diodes and transistor Q2 (a BU406). Tried again, ticking gone and I get the chime! the fan working correctly, but no screen, it just remains black. I tried the obvious, brightness, etc. 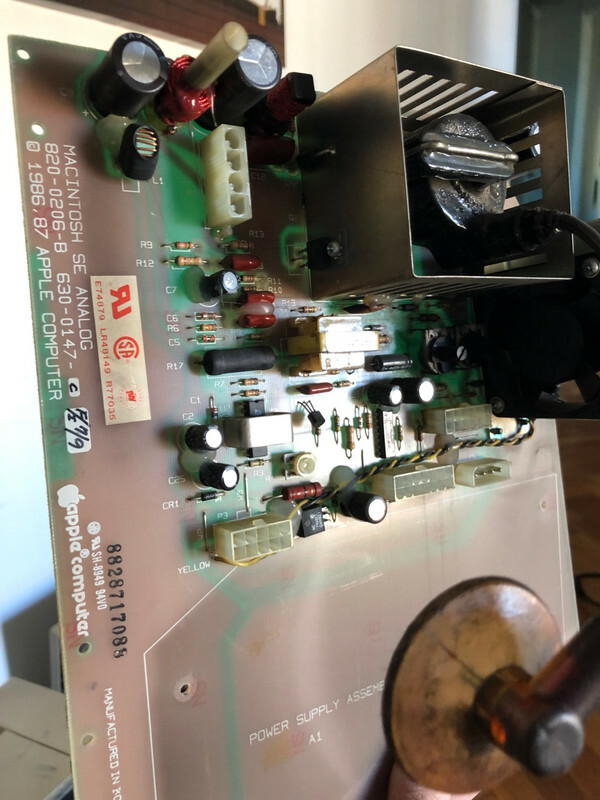 While I was visually checking the neck to see if I saw any glow, transistor Q2 blew undramatically with some smoke and... back to square 1, ticking again, no chime. So, something is burning this transistor, do these sound like symptoms of a bad flyback? I think this could be a bad flyback. I had this happen to me on a Plus several years ago. I had it on, wondered why it was showing an odd herringbone pattern (a classic sign that flyback death is imminent, apparently), and left for a few minutes. When I returned, the display was black, and the room smelled of burnt electronics. The flyback had blown, and it took Q2 with it. Can you see if the flyback on yours has any obvious deformities? If so, a replacement should fix it right up. Even if not, you might try replacing it anyway. Thanks for the input. I can get a Classic with a dodgy logical board. Does the flyback from that one fits the SE?